The latest issue of broadsheet, no.17, May 2016, features the American-based British poet Michael Duffett, currently Associate Professor of English at San Joaquin Delta College in California. The issue is the first journal to feature his poetry in New Zealand. Others included are: Richard Berengarten (UK), William Direen, Jeanne Bernhardt, Anthony Rudolf (UK), Noeline Gannaway, Richard Reeve, Gary Mutton, Jeremy Roberts, Basim Furat (Sudan), Michael O’Leary, Vaughan Rapatahana, Cameron La Follette (USA), and David P Reiter (Australia). In 2008, when I produced the first issue of broadsheet, Duffett came into contact with me through a mutual friend Richard Berengarten. Both poets were educated at Cambridge University, where they edited/founded Carcanet, and are long-term friends. Duffett has contributed to several issues of broadsheet, and I thought it would be nice to feature his work. Duffett’s recent poetry, mostly composed in sonnet form, concerns domestic and family matters, political and social observation, and wide reading in philosophy, art, literature, and history. His eclectic concerns make his work eminently readable to a wide audience without sacrificing skill, craft and technique. Duffett, to use a well-worn phrase, is ‘a poet’s poet’. His collection Forever Avenue featured a wide variety of techniques and forms: iambic pentameter from Marlowe and Milton, rhyming couplets from Chaucer and Spenserian stanzas. One critic, Andrew Rawlinson, called it “A twentieth-century ‘Lyrical Ballads’ about technological Californian society.’ An earlier collection Evolution: A Japanese Journal (1974) comprised mainly shorter imagist poems and forms (haiku/senryu) à la Pound, Williams and Asian poets. Readers in New Zealand now have the chance to read a larger portion of his recent poetry and to see the impressive knowledge and intellectual acumen present in his work. broadsheet, no. 17, May 2016, featuring the poetry of Michael Duffett (USA/UK), is available now. A small hand-stitched book of netball poems, 12 Netball Poems, has been published by The Night Press, Wellington, New Zealand. The book by The Night Press editor Mark Pirie features poems on the Silver Ferns (Sandra Edge, Maria Tutaia, Casey Kopua, Laura Langman and Leilani Read), the Netball World Cup 2015 and children’s netball poems. It is dedicated to Pirie’s mother who played and enjoyed the game. The book’s title “12 Netball Poems” implies the number of players chosen in a netball squad (7 on court, and 5 replacements on the bench). Some of the poems, written between 2012 and 2015, have been published in Valley Micropress and The Wellingtonian newspaper. An addenda by Napier poet Bill Sutton comes in the form of a poem on Irene van Dyk, also reprinted from The Wellingtonian newspaper. The book is printed in a limited edition and is made available for wider distribution as a free ebook from the author’s website (www.markpirie.com) and The Night Press website (see Other Publications). 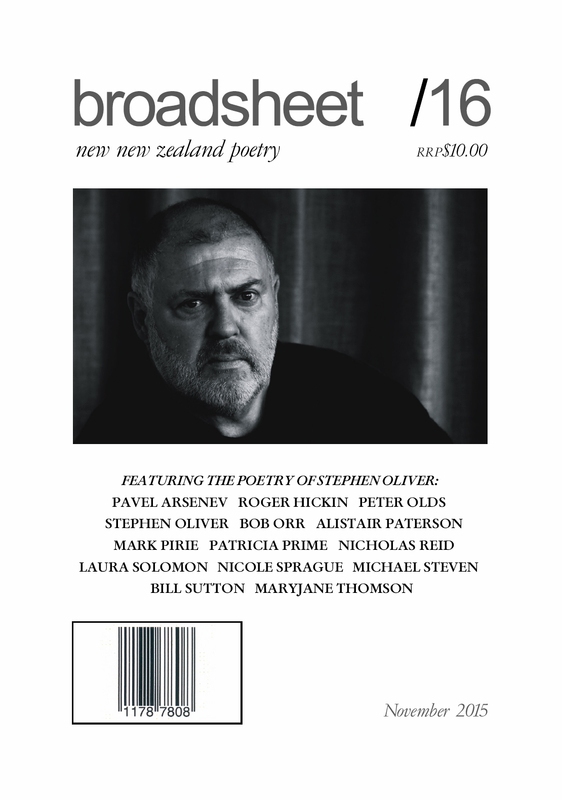 The latest issue of broadsheet, no.16, November 2015, features the Australasian poet Stephen Oliver. The issue is in honour of his significant contribution to transtasman poetry and features a mix of published and unpublished work. Others included are: Pavel Arsenev (Russia), Roger Hickin, Peter Olds, Alistair Paterson, Mark Pirie, Patricia Prime, Nicholas Reid, Laura Solomon, Nicole Sprague (USA), Michael Steven, Bill Sutton and MaryJane Thomson. “Stephen Oliver is a leading transtasman poet. A true antipodean, he was born in 1950 and grew up in Brooklyn-west, Wellington. He left New Zealand in the 1980s and spent 20 years living in Australia after extensive travel (North America to the Mediterranean and Israel). He now resides in Hamilton, New Zealand, after returning around a decade ago. Throughout his working life he has free-lanced as a production voice, narrator, newsreader, radio producer, columnist, copy and feature writer. In Israel he ‘signed on with the radio ship The Voice of Peace broadcasting in the Mediterranean out of Jaffa’. Gifted with an oratorical voice and equally gifted with the qualities of true and genuine poetry, Oliver is a poet I’ve admired for two decades. I have published two collections of his 17 titles: Unmanned (1999) and the major retrospective Night of Warehouses (2001). Stephen in return mentored me and assisted my journal publication. Stephen has an artist’s eye for elegant and handsome presentation, which informs his poetry, with its carefully chiseled and sculpted imagery and line structure. Recently Michael Morrissey considered Stephen was now ‘our greatest living New Zealand poet’ and worthy of Nobel candidature. A close reading of the poetry of Derek Walcott (1992 Nobel Prize for Literature) supports Morrissey’s view. Walcott’s poetry has common principles in tune with Oliver’s poetry. Walcott, a modern oracle, essentially lyrical and narrative, ranging over forms between free verse and traditional rhyme and metrics, has much that favourably compares with Oliver’s oeuvre. Both are exponents of the longer poem and also have written lighter verse. Oliver’s work has been translated into German, Spanish, Chinese, Dutch and Russian and has gained international attention. It’s appropriate then that this issue is in honour of Stephen’s life-long commitment to poetry in his 65th year and his contribution to transtasman poetry, evidenced most tellingly in his recent long poem Intercolonial, one of the finest transtasman poems of the new millennium, in line with Walcott’s Omeros. Working with Stephen I’ve invited a number of his friends and contacts to be in this special tribute issue. Thanks to those who readily sent in their work and shared in my aim of celebrating Stephen’s contribution—a major, Australasian poet. A few poets here are contributors outside the feature: Laura Solomon, MaryJane Thomson and Bill Sutton, and represent broadsheet’s continuing diversity and commitment to new New Zealand poetry.